A new series of images generated with data from NASA's Soil Moisture Active Passive (SMAP) satellite illustrate the surface flooding caused by Hurricane Harvey from before its initial landfall through August 27, 2017. Harvey is now a depression spreading heavy rainfall through the south central and southeastern U.S. The sequence of NASA SMAP images depicts successive satellite orbital swath observations showing the surface water conditions on August 22, before Harvey's landfall (left), and then on Aug. 27, two days after landfall (middle). The resulting increase in surface flooding from record rainfall over the three-day period, shown at right, depicts regionally heavy flooding around the Houston metropolitan area. The hardest hit areas (blue and purple shades) cover more than 23,000 square miles (about 59,600 square kilometers) and indicate a more than 1,000-fold increase in surface water cover from rainfall-driven flooding. The SMAP observations detect the proportion of the ground covered by surface water within the satellite's field of view. The sequence of images depicts successive satellite orbital swath observations showing the surface water conditions on August 22, before Harvey's landfall and then on Aug. 27, two days after landfall. The resulting increase in surface flooding from record rainfall over the three-day period depicts regionally heavy flooding around the Houston metropolitan area. The hardest hit areas cover more than 23,000 square miles (about 59,600 square kilometers) and indicate a more than 1,000-fold increase in surface water cover from rainfall-driven flooding. SMAP's low-frequency (L-band) microwave radiometer features enhanced capabilities for detecting surface water changes in nearly all weather conditions and under low-to-moderate vegetation cover. The satellite provides global coverage with one to three-day repeat sampling, which is well suited for monitoring dynamic inland waters around the world. Other NASA satellites continue to gather data on Harvey as it moves through the middle of the U.S. and weakens. NASA's Aqua satellite provided a visible and infrared look at the weakening, soaking storm. 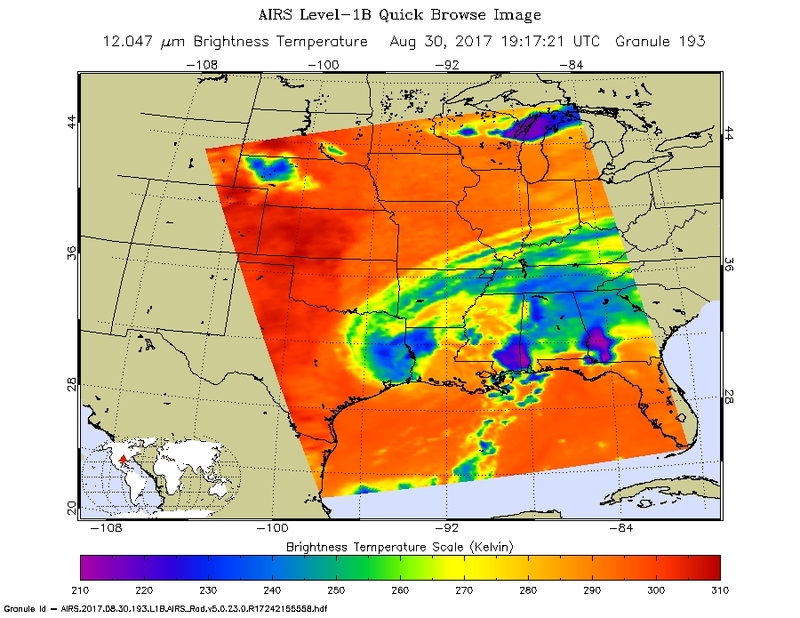 On Aug. 30 at 3:20 p.m. EDT the AIRS instrument aboard Aqua showed some areas with strongest storms and coldest cloud top temperatures near northwestern Louisiana and in bands of thunderstorms over southern Mississippi, northwestern Alabama, and southwestern Georgia. Cloud top temperatures in those areas were as cold as minus 63 degrees Fahrenheit (minus 53 degrees Celsius). On Aug. 30 at 3:20 p.m. EDT the Moderate Resolution Imaging Spectroradiometer or MODIS instrument aboard NASA's Aqua satellite captured a visible light image of Tropical Storm Harvey moving north over Texas and Louisiana. At the same time, the Atmospheric Infrared Sounder or AIRS instrument aboard Aqua provided temperature data in infrared light. 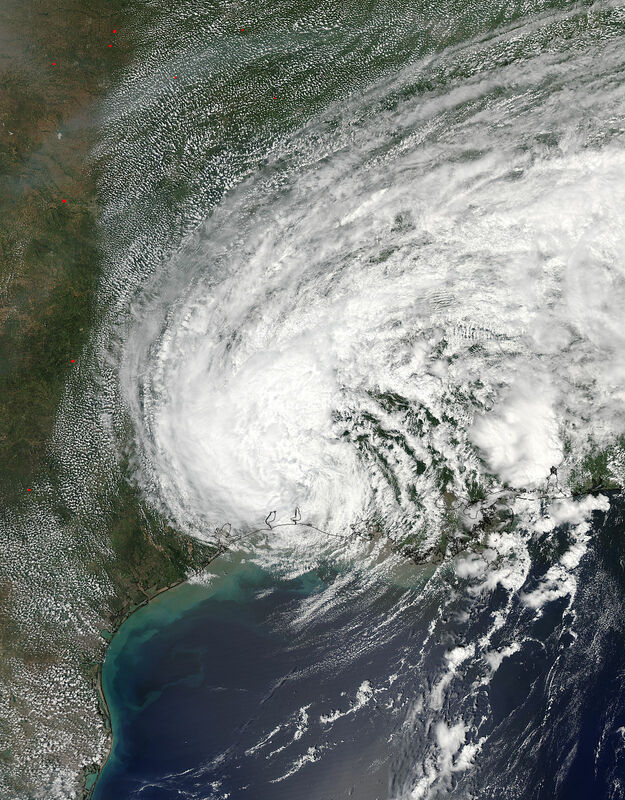 AIRS showed some areas with strongest storms and coldest cloud top temperatures near northwestern Louisiana and in bands of thunderstorms over southern Mississippi, northwestern Alabama, and southwestern Georgia. Cloud top temperatures in those areas were as cold as minus 63 degrees Fahrenheit (minus 53 degrees Celsius). Storms with temperatures that cold have been shown to generate heavy rainfall. The National Hurricane Center (NHC) has issued its final advisory on Harvey. Public Advisories from the Weather Prediction Center (WPC) will provide updates as long as the system remains a flood threat. On Aug. 30 at 3:20 p.m. EDT NASA's Aqua satellite captured this visible light image of Tropical Storm Harvey moving north over Texas and Louisiana. By Aug. 31, Harvey had been downgraded to a depression and was generating flooding rains in far eastern Texas and western Louisiana with heavy rainfall spreading northeastward through the Lower Mississippi Valley and into the Tennessee and Ohio Valleys and central Appalachians over the next day or two. At 11 a.m. EDT (1500 UTC) the center of tropical depression Harvey was located near 32.5 degrees north latitude and 91.4 degrees west longitude. WPC said Tropical Depression Harvey is moving towards the northeast and is expected to continue this motion over the next 48 hours. This forecast track takes Harvey into northern Mississippi by Thursday evening, middle Tennessee by Friday, and into the Ohio Valley states on Saturday, Sept. 2 as a post-tropical low. Kentucky may also lead to flash flooding and increased river and small stream flooding. Credit: ALMA (ESO/NAOJ/NRAO)/E. Falgarone et al. 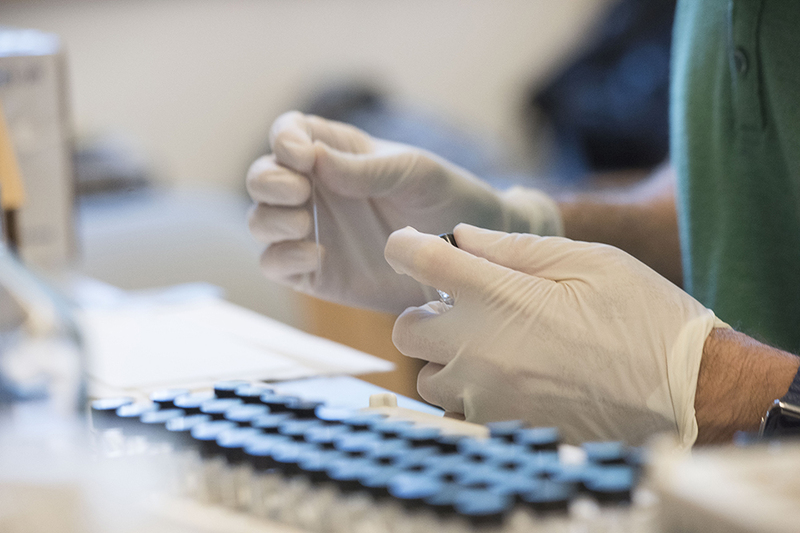 Dr Erin Walsh, lead author and post-doctoral research fellow at ANU, said the impacts of blood glucose on the brain is not limited to people with type 2 diabetes. "People without diabetes can still have high enough blood glucose levels to have a negative health impact," said Dr Walsh from the Centre for Research on Ageing, Health and Wellbeing (CRAHW) at ANU. "People with diabetes can have lower blood glucose levels than you might expect due to successful glycaemic management with medication, diet and exercise. "The research suggests that maintaining healthy blood glucose levels can help promote healthy brain ageing. If you don't have diabetes it's not too early and if you do have diabetes it's not too late." Dr Walsh said people should consider adopting healthy lifestyle habits, such as regular exercise and healthy diets. "Having a healthy lifestyle contributes to good glycaemic control without needing a diabetes diagnosis to spur them into adopting these good habits," she said. "It helps to keep unhealthy highly processed and sugary foods to a minimum. Also, regular physical activity every day can help, even if it is just a going for walk." The research is part of the "Too sweet for our own good: An investigation of the effects of higher plasma glucose on cerebral health" project led by Associate Professor Nicolas Cherbuin, which is part of the longitudinal PATH through life study led by Professor Kaarin Anstey at ANU. "The work would not be possible without being able to longitudinally explore blood glucose in members of the general public," said Dr Walsh. The research has been published in the journal Diabetes and Metabolism. A new twist on listening to you gut. Scientists developed a method to genetically engineer gut bacteria to produce molecules that have the potential to treat certain disorders. We have a symbiotic relationship with the trillions of bacteria that live in our bodies—they help us, we help them. It turns out that they even speak the same language. And new research from The Rockefeller University and the Icahn School of Medicine at Mt. Sinai suggests these newly discovered commonalities may open the door to “engineered” gut flora who can have therapeutically beneficial effects on disease. “We call it mimicry,” says Sean Brady, director of Rockefeller University’s Laboratory of Genetically Encoded Small Molecules, where the research was conducted. The breakthrough is described in a paper published this week in the journal Nature. Among the advantages of working with bacteria, says Cohen, who spent five years in Brady’s lab as part of Rockefeller’s Clinical Scholars Program, is that their genes are easier to manipulate than human genes and much is already known about them. “All the genes for all the bacteria inside of us have been sequenced at some point,” he says. In past projects, researchers in Brady’s lab have mined microbes from soil in search of naturally occurring therapeutic agents. In this instance, Cohen started with human stool samples in his hunt for gut bacteria with DNA he could engineer. When he found them he cloned them and packaged them inside E. coli bacteria, which is easy to grow. He could then see what molecules the engineered E. colistrains were making. “This is a first step in what we hope is a larger-scale, functional interrogation of what the molecules derived from microbes can do,” Brady says. His plan is to systematically expand and define the chemistry that is being used by the bacteria in our guts to interact with us. Our bellies, it turns out, are full of promise. Researchers from Uppsala University have developed a new method to quickly determine whether an infection is caused by bacteria that are resistant or sensitive to antibiotics. Klebsiella pneumoniae bacteria that grow in a microflow chip shot in phase contrast. The bacteria are 0.003mm long and divide every half an hour. "We have developed a new method that allows a determination of bacterial resistance patterns in urinary tract infections of 10 to 30 minutes. By comparison, the resistance determination currently in force requires 1 to 2 days. The rapid test is based on a new microflow plastic chip where the bacteria are captured and growing, as well as methods for analyzing bacterial growth at the single-cell level, "says Özden Baltekin, a doctoral student who performed most of the experimental work. The method is very sensitive and is based on techniques developed to study the behavior of individual bacteria with very high sensitivity. By following if the cells grow in the presence of antibiotics (ie they are resistant) or not (they are sensitive) you can say within a few minutes whether they are resistant or sensitive. "It's super cool that the basic research methods we developed for completely other issues can benefit from such an extremely important medical application," says Johan Elf, one of the researchers behind the study. The detection method is now being developed into a user-friendly product of a company in Uppsala, Astrego AB. The company expects to have an automated test for urinary tract infections already in a couple of years. "The hope is that the method in the future can be used in hospitals and health centers to quickly provide correct treatment and, in addition, reduce the unnecessary use of antibiotics," says Dan Andersson, one of the researchers behind the study. In addition, we believe that the method can also be used in other types of infections, such as blood infections where a fast and correct choice of antibiotics is vital to the patient. The research has been funded by the Swedish Research Council, Knut and Alice Wallenberg Foundation and the European Research Council, ERC. It takes place within the framework of the newly established National Center for Research on Antibiotics Resistance at Uppsala University, UAC (Uppsala Antibiotic Center). The footprints were discovered by Gerard Gierlinski (1st author of the study) by chance when he was on holiday on Crete in 2002. Gierlinski, a paleontologist at the Polish Geological Institute specialized in footprints, identified the footprints as mammal but did not interpret them further at the time. In 2010 he returned to the site together with Grzegorz Niedzwiedzki (2nd author), a Polish paleontologist now at Uppsala University, to study the footprints in detail. Together they came to the conclusion that the footprints were made by hominins. Citation: Gierlinski, G. D. et al. 2017. Possible hominin footprints from the late Miocene (c. 5.7 Ma) of Crete? Proceedings of the Geologists' Association, advance online. Credit: Courtesy of Vilaiwan M Fernandes, Desplan Lab, NYU’s Department of Biology. A time-lapse movie of a fruit fly visual system developing over the course of six hours. A population of glia (bright green above magenta region) from the retina grow and infiltrate into the lamina region of the optic lobe (magenta), where they induce naïve cells to differentiate into neurons. In this way, glia coordinate neuronal development in the retina with that of the brain. Hundreds of scientific studies over two decades have told us that apes are clever - just not as clever as us. A new analysis argues that what we think we know about apes' social intelligence is based on wishful thinking and flawed science. Dr David Leavens, of the University of Sussex, with Professor Kim Bard, University of Portsmouth, and Professor Bill Hopkins, Georgia State University, USA, published their analysis in the journal Animal Cognition. Dr Leavens said: "The fault underlying decades of research and our understanding of apes' abilities is due to such a strongly-held belief in our own superiority, that scientists have come to believe that human babies are more socially capable than ape adults. As humans, we see ourselves as top of the evolutionary tree. This had led to a systematic exaltation of the reasoning abilities of human infants, on the one hand, and biased research designs that discriminate against apes, on the other hand. "Even when apes clearly outperform young human children, researchers tend to interpret the apes' superior performance to be a consequence of inferior cognitive abilities. "There is not one scientifically sound report of an essential species difference between apes and humans in their abilities to use and understand clues from gestures, for example. Not one. "This is not to say such a difference won't be found in future, but much of the existing scientific research is deeply flawed." This isn't the first time science has seen such a pervasive collapse of rigor - 100 years ago scientists were sure that northern Europeans were the most intelligent in our species. Such bias is now seen as antiquated, but comparative psychology is applying the same bias to cross-species comparisons between humans and apes, the researchers say. Professor Bard said: "In examining the literature, we found a chasm between evidence and belief. This suggests a deep commitment to the idea that humans alone possess sophisticated social intelligence, a bias that is often not supported by the evidence." The starting point in comparative psychology research is that if an ape makes a pointing gesture, say a point to a distant object, the meaning is ambiguous, but if a human does it, a double standard of interpretation is applied, concluding that humans have a degree of sophistication, a product of evolution, which other species can't possibly share. In the absence of rigorous scientific research, Professor Bard said, "it is reasonable to ask if current comparative or developmental psychology has anything useful to contribute to our understanding of the 'cognitive foundations' of communication development. "For researchers interested in the origins of language, focusing on behaviours without considering the animal's specific learning experiences will easily and inaccurately load results in favour of humans." Examples of this bias include in one large set of studies, the children were raised in Western households, steeped in the cultural conventions of nonverbal signalling, whereas the apes were raised without that cultural exposure. When both were tested on their understanding of Western conventions of non-verbal communication, of course the children out-performed the apes on some tasks, but it remains ambiguous whether this is due to their evolutionary histories or their specific learning experiences with respect to non-verbal communication. In another study, children aged 12 months were compared to apes aged, on average, 18-19 years old. The study found that humans alone have evolved to be able to point towards an absent object, taking no account of the differences in the humans' and apes' age, life history, or environment. More recent studies have amply demonstrated that, like human children, adult apes do communicate about absent objects. This artist's impression shows the view from the surface of one of the planets in the TRAPPIST-1 system. 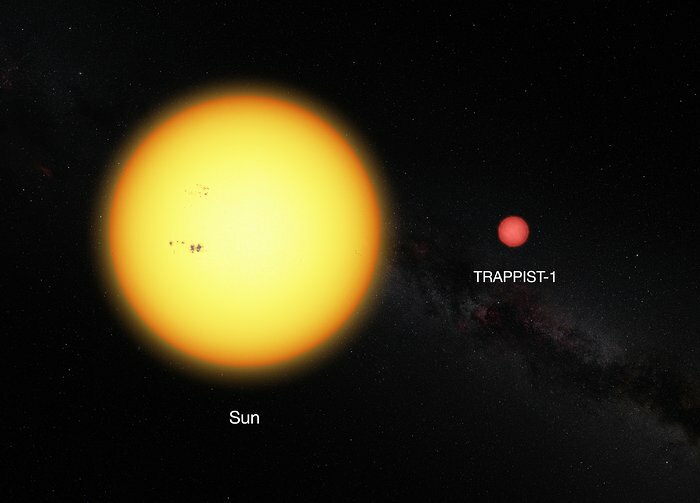 At least seven planets orbit this ultracool dwarf star 40 light-years from Earth and they are all roughly the same size as the Earth. Several of the planets are at the right distances from their star for liquid water to exist on the surfaces. While lower-energy ultraviolet radiation breaks up water molecules -- a process called photodissociation -- ultraviolet rays with more energy (XUV radiation) and X-rays heat the upper atmosphere of a planet, which allows the products of photodissociation, hydrogen and oxygen, to escape. This animation shows all seven planets orbiting the ultracool dwarf TRAPPIST-1. The constellation of Orion (The Hunter) is visible below the star although it looks slightly different from how it appears from Earth because it is seen from a different star system.The artist’s impression in this video is based on the known physical parameters for the planets and stars seen, and uses a vast database of objects in the Universe. The inner planets could have lost more than 20 Earth-oceans-worth of water during the last eight billion years. However, the outer planets of the system -- including the planets e, f and g which are in the habitable zone -- should have lost much less water, suggesting that they could have retained some on their surfaces . The calculated water loss rates as well as geophysical water release rates also favour the idea that the outermost, more massive planets retain their water. 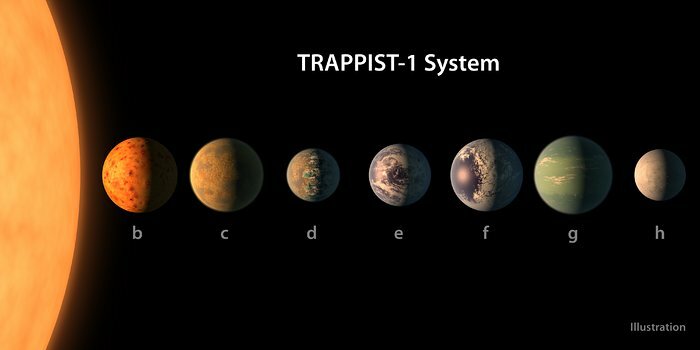 However, with the currently available data and telescopes no final conclusion can be drawn on the water content of the planets orbiting TRAPPIST-1. Just as drivers observe the rules of the road, most pedestrians follow certain social codes when navigating a hallway or a crowded thoroughfare: Keep to the right, pass on the left, maintain a respectable berth, and be ready to weave or change course to avoid oncoming obstacles while keeping up a steady walking pace. Engineers at MIT have designed an autonomous robot with “socially aware navigation,” that can keep pace with foot traffic while observing these general codes of pedestrian conduct. That’s a tricky problem, particularly in pedestrian-heavy environments, where individual paths are often difficult to predict. As a solution, roboticists sometimes take a trajectory-based approach, in which they program a robot to compute an optimal path that accounts for everyone's desired trajectories. These trajectories must be inferred from sensor data, because people don't explicitly tell the robot where they are trying to go. Others have used faster, “reactive-based” approaches, in which a robot is programmed with a simple model, using geometry or physics, to quickly compute a path that avoids collisions. The problem with reactive-based approaches, Everett says, is the unpredictability of human nature — people rarely stick to a straight, geometric path, but rather weave and wander, veering off to greet a friend or grab a coffee. In such an unpredictable environment, such robots tend to collide with people or look like they are being pushed around by avoiding people excessively. Titan placed the two-and-a-half ton vehicle on its path for impending destruction. Yet several mission milestones have to occur over the coming two-plus weeks to prepare the vehicle for one last burst of trailblazing science. NASA's Cassini spacecraft is shown heading for the gap between Saturn and its rings during one of 22 such dives of the mission's finale in this illustration. The spacecraft will make a final plunge into the planet's atmosphere on Sept. 15. "The Cassini mission has been packed full of scientific firsts, and our unique planetary revelations will continue to the very end of the mission as Cassini becomes Saturn’s first planetary probe, sampling Saturn's atmosphere up until the last second," said Linda Spilker, Cassini project scientist from NASA's Jet Propulsion Laboratory in Pasadena, California. "We'll be sending data in near real time as we rush headlong into the atmosphere -- it's truly a first-of-its-kind event at Saturn." Team members reflect on what has made the NASA/ESA Cassini mission such an epic journey -- the extraordinary spacecraft, tremendous science and historic international collaboration. This video uses a combination of animations and actual imagery returned over the course of the mission. The spacecraft is expected to lose radio contact with Earth within about one to two minutes after beginning its descent into Saturn's upper atmosphere. But on the way down, before contact is lost, eight of Cassini's 12 science instruments will be operating. In particular, the spacecraft‘s ion and neutral mass spectrometer (INMS), which will be directly sampling the atmosphere's composition, potentially returning insights into the giant planet's formation and evolution. On the day before the plunge, other Cassini instruments will make detailed, high-resolution observations of Saturn's auroras, temperature, and the vortices at the planet's poles. Cassini's imaging camera will be off during this final descent, having taken a last look at the Saturn system the previous day (Sept. 14). -- Sept. 9 -- Cassini will make the last of 22 passes between Saturn itself and its rings -- closest approach is 1,044 miles (1,680 kilometers) above the clouds tops. -- Sept. 11 -- Cassini will make a distant flyby of Saturn's largest moon, Titan. Even though the spacecraft will be at 73,974 miles (119,049 kilometers) away, the gravitational influence of the moon will slow down the spacecraft slightly as it speeds past. A few days later, instead of passing through the outermost fringes of Saturn's atmosphere, Cassini will dive in too deep to survive the friction and heating. -- Sept. 14 -- Cassini's imaging cameras take their last look around the Saturn system, sending back pictures of moons Titan and Enceladus, the hexagon-shaped jet stream around the planet's north pole, and features in the rings. -- Sept. 14 (5:45 p.m. EDT / 2:45 p.m. PDT) -- Cassini turns its antenna to point at Earth, begins a communications link that will continue until end of mission, and sends back its final images and other data collected along the way. -- Sept. 15 (4:37 a.m. EDT / 1:37 a.m. PDT) -- The "final plunge" begins. The spacecraft starts a 5-minute roll to position INMS for optimal sampling of the atmosphere, transmitting data in near real time from now to end of mission. -- Sept. 15 (7:53 a.m. EDT / 4:53 a.m. PDT) -- Cassini enters Saturn's atmosphere. Its thrusters fire at 10 percent of their capacity to maintain directional stability, enabling the spacecraft's high-gain antenna to remain pointed at Earth and allowing continued transmission of data. -- Sept. 15 (7:54 a.m. EDT / 4:54 a.m. PDT) -- Cassini's thrusters are at 100 percent of capacity. Atmospheric forces overwhelm the thrusters' capacity to maintain control of the spacecraft's orientation, and the high-gain antenna loses its lock on Earth. At this moment, expected to occur about 940 miles (1,510 kilometers) above Saturn's cloud tops, communication from the spacecraft will cease, and Cassini's mission of exploration will have concluded. The spacecraft will break up like a meteor moments later. "The end of Cassini's mission will be a poignant moment, but a fitting and very necessary completion of an astonishing journey," said Earl Maize, Cassini project manager at NASA's Jet Propulsion Laboratory in Pasadena, California. "The Grand Finale represents the culmination of a seven-year plan to use the spacecraft’s remaining resources in the most scientifically productive way possible. By safely disposing of the spacecraft in Saturn's atmosphere, we avoid any possibility Cassini could impact one of Saturn's moons somewhere down the road, keeping them pristine for future exploration." "Other methods are either costly, labor intensive, have low efficiency, or take a long time," said Ming Su, an associate professor of chemical engineer at Northeastern University. With two of his graduate students, Wenjun Zheng and Sichao Hou, he has shown how such a laser system could work, describing the proof-of-principle results this week in the Journal of Applied Physics, from AIP Publishing. The biggest advantage of lasers, Su explained, is that they can be used at the site of decontamination. Many conventional decontamination methods require digging up contaminated soil, hauling it somewhere else to be cleaned, and then returning it -- a process that is expensive and time-consuming. Laser induced soil decontamination (A), laser generated patterns (B and C), and an infrared image of temperature distribution along track of laser movement (D). These methods also have shortcomings in how well they can decontaminate. One of the most popular methods uses water or organic solvents to wash away the pollutants. But oftentimes, washing doesn't eradicate contaminants; it only dilutes them. And even if the soil is clean, you might be left with another problem in contaminated water: The organic solvents can themselves be harmful to people, and the process can create byproducts that become secondary contaminants. Lasers, however, can be used on-site to completely break down contaminants. "There is no other method that can do it at such high efficiency," Su said. Citation: "Laser induced rapid decontamination of aromatic compound from porous soil simulant," is authored by Wenjun Zheng, Sichao Hou and Ming Su. The article will appear in The Journal of Applied Physics on August 29, 2017 [DOI: 10.1063/1.4985813]. Northern China’s roadsides are peppered with deciduous phoenix trees, producing an abundance of fallen leaves in autumn. These leaves are generally burned in the colder season, exacerbating the country’s air pollution problem. Investigators in Shandong, China, recently discovered a new method to convert this organic waste matter into a porous carbon material that can be used to produce high-tech electronics. The advance is reported in the Journal of Renewable and Sustainable Energy, by AIP Publishing. The investigators used a multistep, yet simple, process to convert tree leaves into a form that could be incorporated into electrodes as active materials. The dried leaves were first ground into a powder, then heated to 220 degrees Celsius for 12 hours. This produced a powder composed of tiny carbon microspheres. These microspheres were then treated with a solution of potassium hydroxide and heated by increasing the temperature in a series of jumps from 450 to 800 C.
The investigators ran a series of standard electrochemical tests on the porous microspheres to quantify their potential for use in electronic devices. The current-voltage curves for these materials indicate that the substance could make an excellent capacitor. Further tests show that the materials are, in fact, supercapacitors, with specific capacitances of 367 Farads/gram, which are over three times higher than values seen in some graphene supercapacitors (Link: http://aip.scitation.org/doi/full/10.1063/1.4984762). Galvanostatic Charge/Discharge (GCD) curves at different current densities, from 0.5 to 20A/g. The research, led by Hongfang Ma of Qilu University of Technology, has been heavily focused on looking for ways to convert waste biomass into porous carbon materials that can be used in energy storage technology. In addition to tree leaves, the team and others have successfully converted potato waste, corn straw, pine wood, rice straw and other agricultural wastes into carbon electrode materials. Professor Ma and her colleagues hope to improve even further on the electrochemical properties of porous carbon materials by optimizing the preparation process and allowing for doping or modification of the raw materials. The latest roadmap to a 100% renewable energy future from Stanford's Mark Z. Jacobson and 26 colleagues is the most specific global vision yet, outlining infrastructure changes that 139 countries can make to be entirely powered by wind, water, and sunlight by 2050 after electrification of all energy sectors. Such a transition could mean less worldwide energy consumption due to the efficiency of clean, renewable electricity; a net increase of over 24 million long-term jobs; an annual decrease in 4-7 million air pollution deaths per year; stabilization of energy prices; and annual savings of over $20 trillion in health and climate costs. The work appears August 23 in the journal Joule, Cell Press's new publication focused on sustainable energy. This infographic represents the roadmaps developed by Jacobson et al for 139 countries to use 100 percent wind-water-solar in all energy sectors by 2050.